Hu Yuching from China got a trophy in the end. 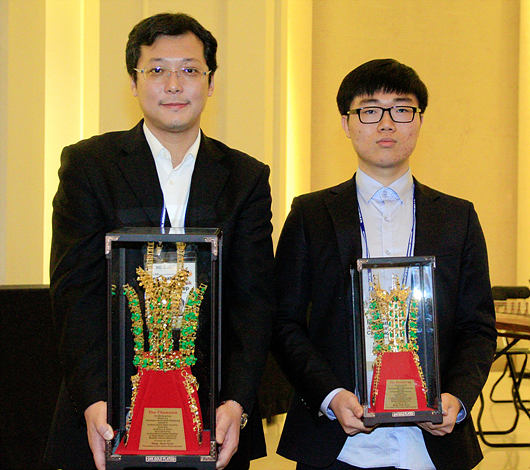 It is so suprising that Hu Yuching 34 year old got a trophy in the 10th KPMC this year. He has attended all timms from the 1st KPMC and came up second 4 times. But this year he finally won KPMC and suprised people. Hu Yuching a representative of China got 6 wins straight and came up first in the 10th KPMC which was held from 23th to 25th in Seoul Korea. He asnwered in the interview that I was so pity to get second in the past, but now I feel I got my goal in KPMC. This KPMC is the world amateur tournament which all representatives of 54 countries compete for the top. This year, 15 players from Asia, 28 players from Europe, 1 player from Africa, 8 players from America and 2 players from Oceania attended. Kim HeeSoo a representative of Korea won 4 games in a row but lost against Hu Yuching in the 5th match which was kind of deciding match. He reminded of the game with Hu Yuching that I thought it was time to arrange the game for me, but my group was killed when I tried to kill his group in a counter. Christoph Pope from Romania came up thrid, while Japan came up 5th and US came up 4th.